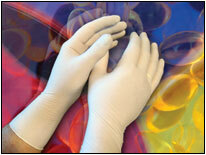 We carry the highest quality sterile nitrile cleanroom gloves, Class 100 and above. What Are Sterile Nitrile Gloves? Sterile nitrile gloves are sterilized by gamma irradiation to meet AAMI and ASTM standards. They are approved for use in both USP797 and chemotherapy applications. Each case is marked with batch numbers to meet internal QC requirements and ensure full product trace-ability. Available as class 100 or 1000, the gloves are packaged one of two ways - either by each individual pair or in one larger bulk pack.